Xtreme Sponge, LLC manufactures the finest melamine cleaning products of the new millennia, miraculously removes stains from practically anything. As a value-added manufacturer, we use our extensive media resources to create and market our innovative cleaning products to the residential, corporate, hospitality, and jan/san markets in North America. Xtreme Sponge is truly the easiest way to clean hard surfaces with potentially permanent marks. Simply wet the sponge and effortlessly rub it across set-in dirt and grime. 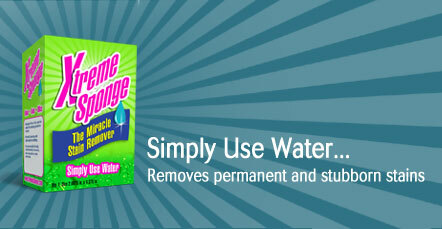 Watch the sponge magically erase stains and tough dirt from surfaces using only water. It is free of harmful chemicals, environmentally friendly, and safe for your hands and skin. The Xtreme Sponge effortlessly breaks up stubborn stains and dirt leaving surfaces looking like new. It works at the source, lifting trapped dirt from grooves and surfaces.